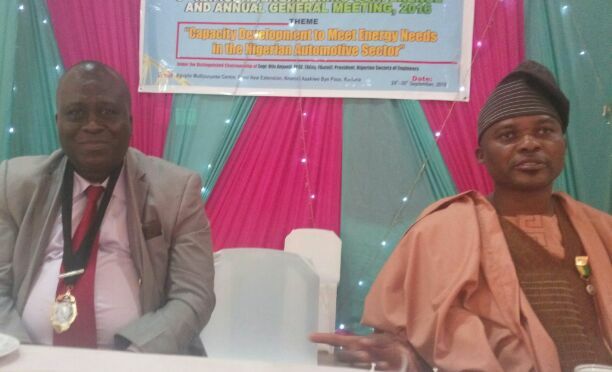 Cross section of Automotive Engineers rose from their two-day National Engineering Conference and Annual General Meeting held in Kaduna over the weekend to urge the Federal Government to involve correct professionals in its quest to address the current economic recession the country is faced with. They said there was no point to be in haste to propound theories that are not workable, but to understand the challenges on ground, get the correct people to be involved if the current administration is serious about revamping the nation’s economy to enviable standard. The AutoEI conference also said it is in support of Federal Road Safety Corps (FRSC) Speed Limit Devices implementation but, suggest involvement of its certify members to install the products professionally, promised to continually guide and protect Nigerians and Nigeria for greater development. General Manager, Peugeot Automobile Nigeria (PAN) who doubled as National Chairman of Automotive Engineers Institute (AutoEI), Engr. Austen Okolo noted with kin interest that, economy has nothing to do with individual perception based on personal relationship with others, but getting the right people to do the right thing should be the utmost priority to drive the nation’s economy to a safe destination, “whether you like him or not our focus should be the economy not the individual”. According to him, “People in authority have to drive the policy that will enhance productivity. This can be done by encouraging people in the country to patronize home made vehicles which will improve all the value chain from point of generating raw materials to final production. The moment our focus shift from the object which is the economy, wrong decisions like wrong placement of manpower will be taking and that will lead to negative impact. “Even in this forex issue we are talking about, you also need experienced engineers on the decision table though it is the economists’ thing but sometimes, they don’t understand the full impact. For example, it is between N472 and N475 to a dollar which is not even available. That means all the manufacturing concerns especially the auto sector, you have a lot of naira and you cannot lay hand on the forex which you need to get the components of things you need to manufacture for you to continue business. Literarily, it means your coffin in moving down and you are already seeing the end because you are eating up all your stock. “In the area of academic, training and curriculum, we need to have the right curriculum to have the right products and then arrive at effective decisions which automotive engineering is relevant. In the area of core activities in the sector, we need experienced automotive engineers to be able to revamp; be it in the process itself, regulation, certification and standardization of the process. Before you can have a process that will be called manufacturing, there are some basic things you need to have then which means there must be standard template that will adjudge whether you are or you are not. “So we have gotten to a stage where all processes must be certified which means every manufacturing concern we have Standard Organization of Nigeria (SON), they are well trained and they have the capacity to conduct International Standard Organization (ISO) certification for diverse areas of manufacturing; ISO 2001 and 2008 which is now been transcended to 2015. With those ones in place, some of the myriad of challenges we are now experiencing would have been adequately handled”, he stressed. Speaking on the theme of the conference, “Capacity Development to Meet Energy Needs in the Nigerian Automotive Sector”, President, Nigerian Society of Engineers, Engr. Otis Anyaeji, who was represented by Engr. Ibitoye Kilomodemo reiterated the need to promote indigenous companies so the over relenting on forex will reduce. “what we are saying is that we should not be over-dependent on foreign products when we have human and material capital we can develop to revive this country. If we believe in ourselves as a country, we also need to believe in our local products development which if we do, will naturally neutralize the headache attached to forex”.